First Kiss Friday with Beth Barany & a giveaway! It’s First Kiss Friday, my lovelies! Please welcome my friend and fellow San Francisco Area of Romance Writers of America chapter member Beth Barany. 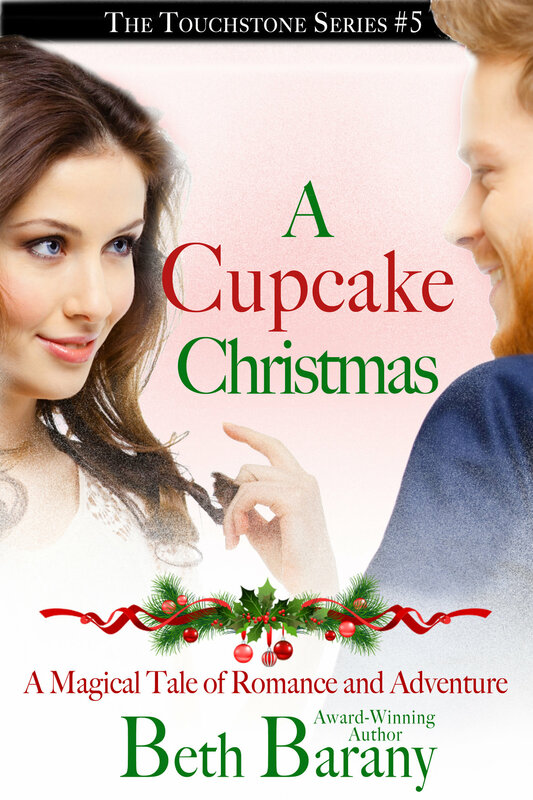 Beth is sharing an excerpt from A Cupcake Christmas. Be sure to read all the way to the end about her giveaway. Happy reading and enjoy! “Kate took his hand and let Florian bring her to standing. She wasn’t surprised by the sparks that flowed from him into her, she welcomed them, in fact. He still hadn’t answered her question. “Shall we stroll?” He tucked her hand into the crook of his arm, in an old-fashioned charming way. They were shoulder to shoulder. “To the van?” She shivered at their closeness. “If you like.” He gazed into her eyes. “I like.” If her voice sounded husky, she didn’t mind. Florian grinned. She could swear his eyes twinkled but maybe it was the light of the restaurant or of the sky. Dusk was falling. Low sunlight reflected off the fog hovering above them. Kate walked back with him, arm in arm, to her van parked behind the kitchen a block away. There they stood in the cold foggy night. She never really paid attention to their height difference. Maybe because she was a few inches taller in her work shoes and hadn’t noticed. Now, she was in her flats and the top of her head came to just above his nose, which had a light dusting of freckles to go with his shock of red, wavy hair. “Yes, I’d feel better about Saturday.” She stared at his lips. “But what do you want to do?” he said softly and stepped closer to her. Somewhere a horn honked. She blinked and gazed into his sparkling green eyes. “I want—” You, I want you to stay, she wanted to say. He searched her eyes, waiting. “To have a—” She shook her head. No, she didn’t want a fling. But she wanted him, something more meaningful. “I like how you think.” She laughed and kissed him on the lips. Just a brief kiss. He was delicious—sweet and alluring. He leaned in to deepen the kiss, but she pulled away. “Come on. Let’s walk to my place. It’s not far.” She stepped toward the street. “I don’t mean to be,” she said quietly, turned toward him, and held out her hand. “Will they catch us doing this?” Florian leaned in to land a kiss on her lips. Her insides warmed. She kissed him back. He tasted sweeter than the chocolate shake they’d shared for desert. It took twice as long to walk the fifteen minutes to her apartment. They had to stop every few minutes for more kisses. She felt warm all over, as if she were enveloped in the softest comforter. They made it up the two flights of stairs without stopping too many times. When she opened the door to her apartment, she felt breathless with the kissing and how he made her laugh with his suggestions for ridiculous cupcake recipes, each one more silly than the next, and jokes about putting on a show for the whole neighborhood. They stumbled into her front hallway of her one-bedroom apartment. She shut the door behind them and then pulled Florian toward her. “I want to kiss you without walking,” she said into his neck. She inhaled his wonderful scent of man and cinnamon. She was burning up and couldn’t wriggle out of her coat fast enough. He helped her, and then leaned in for a long, deep kiss that had her sighing and reaching to slip off his coat. She caressed his strong back muscles under his shirt and sighed some more. “I want to practice a much more ancient art.” She nuzzled his neck and smoothed her hands on his chest, his strong chest, and over his strong muscular arms. He kept himself in good shape. Must be all that lifting and stirring. Too bad he still had his shirt on. She kissed him and pulled him toward her bedroom. “Let’s get practicing.” She hadn’t asked him to stay and he hadn’t reminded her he was leaving. At least they had now. What if you risked losing your baking legacy by cooking up a love truly special? Florian MacMillian needs a final job to complete his baking resume—preferably a job where he’s unlikely to blow things up with his unruly magic—before returning to the North Pole and taking his rightful place as Master Baker to all the elves. Kate Delore desperately needs help in her fast-growing cupcake business. Florian is a perfect fit, so she brings him on as baker. For a short time, Florian is happily up to his elbows in batter, and Kate’s business is booming. But when things heat up between them, Florian wonders if he should risk his legacy to cook up something truly special. 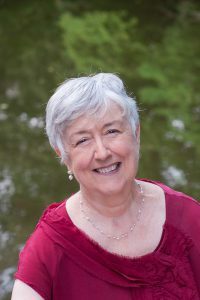 Award winning author, Beth Barany writes in several genres including young adult adventure fantasy, paranormal romance, and soon science fiction mysteries. Inspired by living abroad in France and Quebec, she loves creating magical tales of romance, mystery, and adventure that empower women and girls to be the heroes of their own lives. 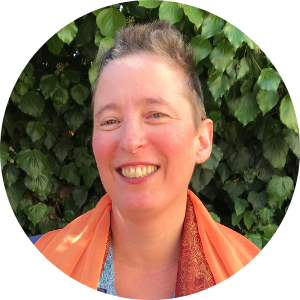 For fun, Beth enjoys walking her neighborhood, gardening on her patio, and watching movies and traveling with her husband, author Ezra Barany. They live in Oakland, California with a piano and over 1,000 books. More about Beth’s fiction and to get a free time travel romance, go here: http://author.bethbarany.com/free-romance-story/. Post your favorite silly cupcake recipe in the comments and Beth will pick one lucky winner at random to win an e-book edition of A Cupcake Christmas. It’s another First Kiss Friday and today I have my friend Caroline Warfield as my guest. 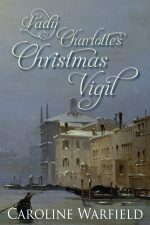 Caroline has a new story out entitled Charlotte’s Christmas Vigil that is just in time for the holiday’s. We hope you enjoy this first kiss scene. Happy reading! “Don’t get up, Lottie. Are you well?” He raised the candle to see her face better. The purple smudges under her eyes hadn’t abated. His eyes scanned her, from the glorious hair to the tips of those graceful toes. He tried to remind himself of his professional demeanor, but diagnosis played no part in this scrutiny. “Salvo?” Lottie asked, her voice thick. She pulled her gown down to cover herself. He suspected she blushed rather in the semi-darkness, but he couldn’t pull his eyes away. His feet moved into the room before he could tell them to stop. He had her in his arms before either could take another breath. “Thank you,” he breathed against her mouth, just before he kissed her. Lottie pulled back and gasped. He would have pulled back then, but a second later, she moved closer and pressed her mouth to his. He tasted her gently, but didn’t probe. He cupped her face, so he would not pull her up against his arousal, though he yearned to pull her close. He kissed her eyes and down her cheek before setting her away from him. 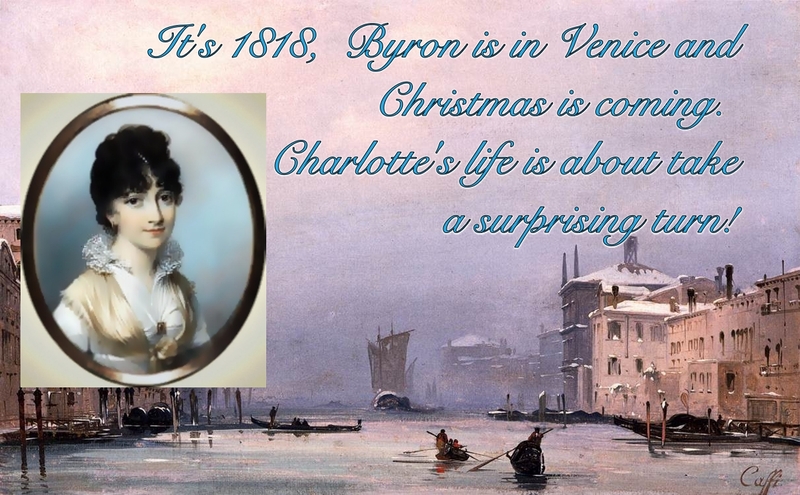 Lady Charlotte clings to one dream—to see the splendor of Rome before settling for life as the spinster sister of an earl. 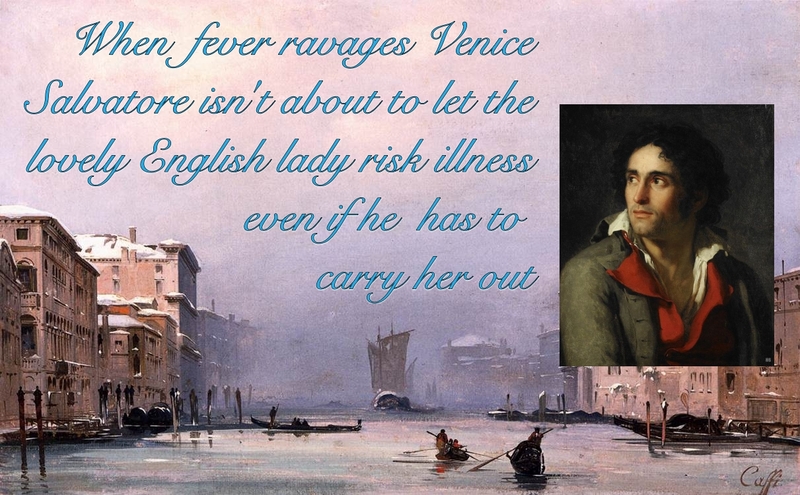 But now her feckless brother attempts to imitate his idol, Byron, by swimming the Grand Canal, falls ill, and forces her to wait again, stranded in Venice halfway to the place of her dreams. She finds the city damp, moldy, and riddled with disease. As a physician, Salvatore Caresini well knows the danger of putrid fever. He lost his young wife to it, leaving him alone to care for their rambunctious children. He isn’t about to let the lovely English lady risk her life nursing her brother. But Christmas is coming, that season of miracles, and with it, perhaps, lessons for two lonely people: that love heals the deepest wounds and sometimes the deepest dreams aren’t what we expect. Caroline Warfield grew up in a perapatetic army family and had a varied career (largely around libraries and technology) before retiring to the urban wilds of Eastern Pennsylvania, and divides her time between writing and seeking adventures with her grandbuddy and the prince among men she married.